An upper ridge is centered over west-central Europe while a upper trough moves across Scandinavia. One upper trough moves across the Middle East and another upper low is centered over Morocco and SW Iberia. A new short-wave trough pushes from the N Atlantic towards the North Sea. ENH risk have been issued for S Turkey and S Crete island with threat for severe to extremely severe winds, downslope winds could locally be in excess of 120 km/h. SLGT risk has been issued for areas surrounding the ENH risks across S Aegean sea and S Turkey with threat for severe winds in excess of 90 km/h. SLGT risk has been issued for N Atlantic into N Scotland with threat for severe winds in excess of 90-100 km/h. 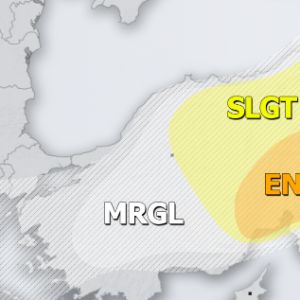 MRGL risk has been issued for N Morocco into NW Algeria with threat for isolated severe storms, capable of producing marginal hail, severe winds and torrential rainfall. MRGL risk has been issued for Middle East with threat for isolated severe storms, capable of producing marginal hail and severe winds. 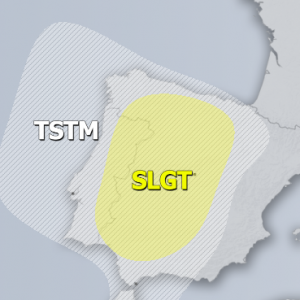 TSTM risk areas have been placed where convective storms are likely to occur.